Lojango Design is the trading name of milliner Jas Mathews, working in rural Devon in the south of England. Known as the Home of the Flat Pack Hat, all Lojango hats are designed to travel well. All the hats are British made in the heart of the Devon countryside by me in my own workshop. I take pride on not importing or outsourcing any of the hats, neither do I mass produce for the retail market as most other 'designer milliners' in the UK do, in fact I do not supply my designs to any other retailers so you can always be sure of purchasing a unique 'limited edition' hat. They are only sold at a few selected venues and via my own website. I have been designing and making hats since the early 1990's, using predominantly natural fabrics and organic themed decorations. Styles have evolved over the years and and I now make ranges of sun hats, rain hats and hats for special occasions. Always stunning and supremely comfortable, Lojango hats are very affordable too. 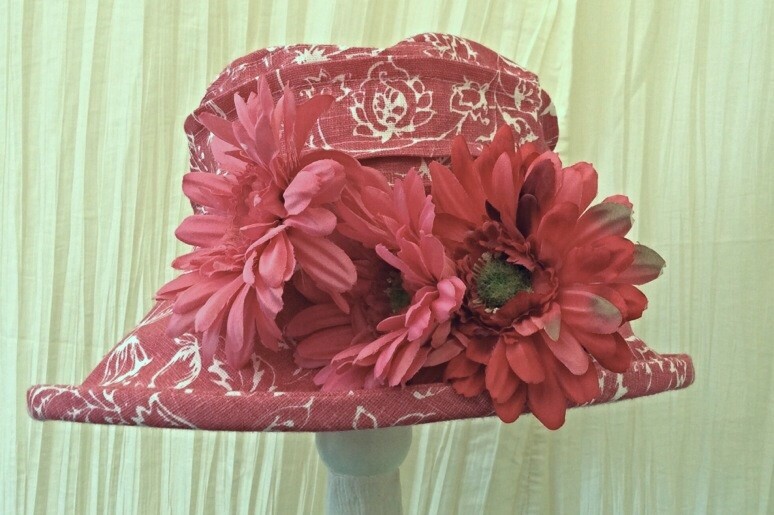 One of our summer occasion hats, a 100% cotton hat with a removable flower brooch, ideal for travelling.